I love living in NZ, it enables me to be the first in the world to wish everyone a happy World Kidney Day. May your kidneys never lack oxygen, be always filtering, and ever distant from the nephrologists biopsy needle! This year’s theme for World Kidney Day is “Kidneys for Life: Stop Kidney Attack.” If you’ve not caught up with my myriad of other posts, Kidney Attack (aka Acute Kidney Injury) is the rapid loss of kidney function and/or structural damage brought about by toxic damage to the kidneys or temporary loss of blood to the kidneys. This week I published a blank post entitled “A list of effective treatments for Kidney Attack.” There is no known treatment – merely acute dialysis, a support for the kidneys, not a treatment. There is no treatment because detection is delayed and difficult and because not enough research has been done. The good news is that I and many others around the world are engaged in finding new ways of detecting this disease. Before I list some of the good news I want you all to repeat after me “30,000 kidney attacks a year in New Zealand, 1300 deaths.” If you live out of New Zealand you may say “Two million die of Kidney Attack each year.” Now tell someone else … anyone … the next person you see (not your boss if you read this at work). Well done, thank you. Hooray – we have for the first time means of measuring structural damage to the kidneys. For us, this is the X-ray moment. Imagine life before the X-ray – all that could be said is that you could no longer bowl a bouncer (throw a curve ball), play the piano, or dance a jig (whatever that is). In other words, all that could be said was function was lost. With the X-ray actual injury to the bone could be observed. Importantly, it could be observed before function was lost permanently. The measurement of various molecules we make in the urine are to us like the X-ray – they are measures of injury to the kidney (we call them biomarkers). which biomarkers add the most value to what we already know and enable the best assessment of risk of poor outcomes. how best to utilise creatinine in Randomised Controlled Trials to tell if an intervention is improving kidney function. All these add up to progress. 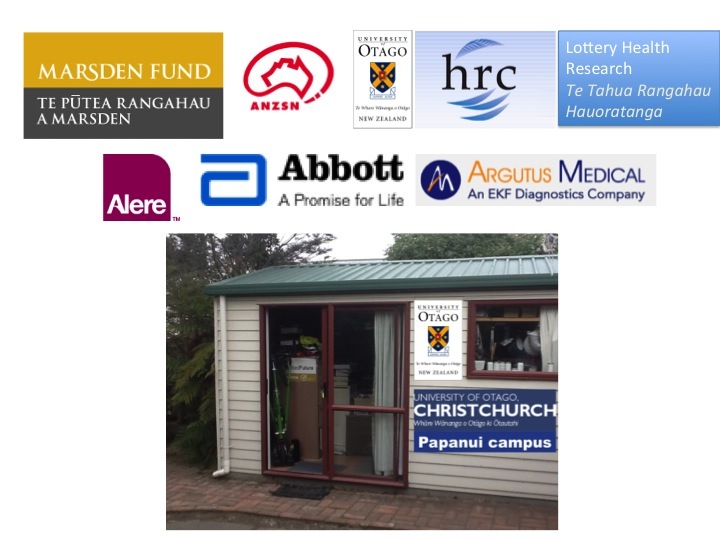 My own and my group’s work over the last 6 years has received funding from a number of funders (see logos attached) some of which originate with your tax dollar – hence my commitment to keep the tax payers informed. I am indebted to my boss, Professor Zoltan Endre, not only did her hire me (I think he mistook Physicist to mean Physician! ), he has taught me heaps and consequently we have formed a strong collaboration. Our work has also depended on the good staff of Dunedin and Christchurch Hospital ICU’s, Christchurch Emergency Department, and the Canterbury Health Laboratories. Without the commitment to research these people make, progress would not have been made. Most important are the patients or their families who have consented for us to take extra samples or enroll them in a trial. The decision to participate is often made at a difficult time – families wrestling with issues of possible death or long term health issues of their loved ones. I salute them. I thank them. New hope, new medicines, new tests, and new procedures are built on the courage and generosity of the patients and families who participate in research. Sponsors who have provided grants (top row), or run assays (middle row), or provided free accommodation (me!) for the Christchurch Kidney Research Group, University of Otago.